Happy Birthday Marine Corp. | A.B.E. Remodeling, INC.
Hello Everyone... Today is the day to reconize the Marines. Here is some information you might find interesting and you may learn more about our "Marines" Join me in saluting them today !!! 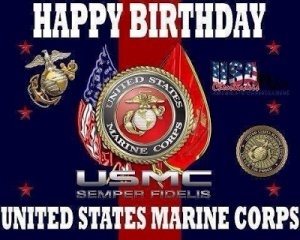 Happy Birthday Marines..everywhere. The United States Marine Corps Birthday is observed annually on November 10. The United States Marine Corps, a branch of the United States Armed Forces, is responsible for providing power protection from the sea using mobility of the United States Navy to rapidly deliver combined-arms task forces. November 10, 1775 was the day that the Continental Marines, later renamed the United States Marine Corps, was established. The birth of the U.S. Marine Corps began as a way to augment naval forces in the Revolutionary War. The recruiting headquarters was in the Tun Tavern on Water Street in Philadelphia, which is considered to be the birthplace of the Marines. The Corps was abolished at the end of the Revolutionary War. However, on July 11, 1798, Congress ordered the creation of the Corps, named it the United States Marine Corps (USMC) and directed that it be available for service under the Secretary of the Navy. The USMC shares many resources with the other branches of the United States military. However, the Corps has sought to maintain its own identity with regards to mission, funding and assets while utilizing the support available from the larger military branches. While the Marine Corps does have fewer installations than other branches, many Army posts, Naval stations and Air Force bases have a Marine presence. In his birthday greeting more than 70 years ago, General Alexander Vandegrift, our 18th Commandant noted that, "A birthday is a fitting time to peer backward - and forward." That year, Marines reflected on an extraordinary year in combat during their amphibious drive across the Pacific. Despite the challenges and the horrific conditions, Marines prevailed at Guam, Saipan, and Peleliu. On 10 November 1944, Marines looked back with pride on their accomplishment - confident in their ability to meet future challenges. In 2004, 20,000 Marines deployed to Al Anbar Province, Iraq - many Marines celebrated the birthday in places like Fallujah, Ramadi, and Al Qaim while decisively engaged in combat. That year, Marines also responded to crisis in the Pacific following a tsunami which claimed the lives of more than 200,000 people. On 10 November 2004, Marines looked back with pride on their accomplishments - confident in their ability to meet future challenges. Some things change. We have adapted our organization, training, and equipment to the ever-changing operating environment. Some things remain the same. Marines continue to attack challenges with the same courage, commitment, loyalty, self-sacrifice and adaptability as their predecessors in Peleliu and Fallujah. On 10 November 2014, Marines looked back with pride on our accomplishments- confident in our ability to meet future challenges. Thank a Marine for their service. Use #MarineCorpsBirthday to post on social media. Hope you enjoyed this selection. Till next time, all our best.